Simple, convenient and environment friendly, Combo of 2 Solar Lantern with Fan is a perfect companion while hiking, camping, outages and other emergencies. Made from Aluminium, ABS plastic & high quality stainless steel handles, it is durable and sturdy that will serve years to come. 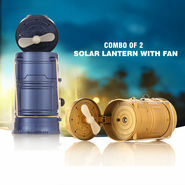 This versatile lantern can be charged by multiple sources including built-in solar or home electricity via power cord. Compact and lightweight, it is easy to use and carry when traveling. Product is good . Specially torch quality is too good . I recommend to buy this solar light. Combo of 2 Solar Lantern with FANVSCombo of 3 Rechargeable Solar Lan.. Combo of 2 Solar Lantern with FAN VS Combo of 3 Rechargeable Solar Lan..
Combo of 2 Solar Lantern with FANVSI Kall Solar Lantern + Portable C.. Combo of 2 Solar Lantern with FAN VS I Kall Solar Lantern + Portable C..
Combo of 2 Solar Lantern with FANVSColorful Lights Solar Lantern (Bu.. Combo of 2 Solar Lantern with FAN VS Colorful Lights Solar Lantern (Bu..